We handle all forms of cases including medical malpractice, motor vehicle, hit and run, negligence, slip and fall, lead paint poisoning, construction, etc. Not only will our attorneys and private investigators go to visit you wherever you may be in New York or New Jersey, but our firm can refer you to medical personnel who will provide door to door service to medical facilities for all treatment. We work hard to obtain police reports, medical reports, expert testimony, photographs and other media recordings, government citations issued against the opposing parties, evidentiary materials, witness statements and testimony, etc. Our legal services, which include everything from settlement negotiations with slippery insurance companies up through trial, will be provided at no cost to you. If we do not recover any monetary compensation for you, then you will have no legal fees to pay. We will charge you ONLY if our attorneys collect money on your behalf. Therefore, there is no risk to you for legal fees. If you have been injured, then you have a limited time to act before the law prevents you from asserting your rights. So don't wait. Schedule a Consultation Now! No case is too complex, we are familiar with the intricacies of personal injury claims. 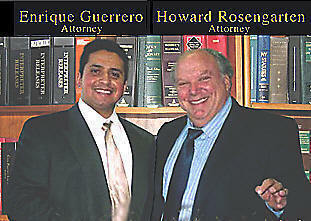 Our lawyers are seasoned courtroom advocates who present the facts and arguments to create winning cases. We have earned the respect of the city's judges and other legal officials. Our expertise ensures our clients' rights are fully protected. $5,300,000 settlement for the family of client killed. Over $1,000,000 for a client seriously injured.